Kath was born towards the end of 1926 in the far end cottage, No 4 of Beech Farm Cottages, Button End. Her father Fred worked on Crow’s Beech Farm after he was married in early 1926. Before then he cleaned shoes. He then moved to work on a farm in Foxton for a short while but then Kath’s family lived on a farm in Hauxton, working for Rodwells based in Shelford. As a child Kath’s dad would take her in a tumble cart (one with two wheels) to Bateman St in Cambridge to get grain from the brewery which would be mixed with poll (white substance) for feed for the pigs. Kath would also pick up eggs from the chickens around the haystack. When the farm was sold to the Howards, her dad Fred and family moved into a bungalow, then not much later to Manor Close in Harston when Kath was about 5. In war time Fred Collins went to work for the River Board (at Brooklands Ave) clearing out ditches. Kath’s mum Nellie Horner and her grandparents Martha & Arthur Horner had moved to Hurrells Row before the War. Martha lived at no 10. It had a sitting room, narrow scullery on the back, twisting narrow stairs and two bedrooms, an outside toilet and a coal area. Kath’s dad’s sister who had several children lived in Hurrells Row at the end. It had an upstairs but the washing was done downstairs where the Clock Shop later was. Outside each house were built outhouses to house a toilet and a coal store. There were very tiny backgardens with a wall boundary. Kath’s grandmother Martha (nee Northrop) was the aunt of Mrs Rivers who lived in the Footpath. Her Gran’s brother (Northrop) lived at one end of the cottages opposite the church on the bend; Mrs Plumb lived at the left end. Chris Northrop lived in the houses opposite the Queen’s Head. Two of his siblings were Connie and Violet.Their dad worked on the railway. They used to get water from a pump or fountain at the top of Manor Close near the High St, where two council houses were, the left hand side had steps down with a deep ditch nearby, that the water ran into. Railings were put up to protect people from falling in. They got running water just before the war – one cold tap. The first Manor Close houses were built near the main road, others were built later at the top end, when the builders had more money. As a child Kath would play with a whip and top or hopscotch on the main road as there were hardly any cars then and they went slow and they had plenty of time to move out the way when they saw the odd one such as Mr Ayre’s son’s car. At the junction of London Road and the High St there used to be an RAC box in the middle of the road. Kath always went to Harston school, never Hauxton. Initially her Uncle Bill took her to school on the carrier of his bicycle, then later her dad put her on the 108 bus (from Cambridge) and met her from the bus at lunch, then after school. She only stayed at school for lunch, eating her sandwiches, if the weather was bad. She was taught in turn by Miss Jackson from Hauxton, another Miss Jackson (who lived above Mumford’s shop), then Miss Harvey (who lodged in the cottage to right of Chapel Lane owned by Tanner family- it has roses above archway now). In winter the girls did cookery, while the boys did woodwork; in summer the girls did washing and the boys would put poles into holes in the playground and erect a washing line. Kath recalls taking a bath container to the pump and trough on the Memorial Green, near the school, to collect water to do the washing – she fell over in the water once. The boys would play football and cricket on the Park. The boys would work on a patch of allotment in what is now Orchard Close – as she came out of school Kath used to walk past and look at her future husband Bert work there- he was 8 years older than her. Kath used to go to the Girl Guides in the Village Hall led by Mrs Bissecker’s daughter, Bunty. The latter married and moved away down south. (Bunty had a sister). Audrey Matthews then took over as the guide leader. As Kath was the eldest child she often had to run errands. Places she remembers going to are the butchers shop which used to be at the back of the present PO. It was run by Mr Ellis of Shelford. She used to get chops for 6d and pudding beef for similar amount. To the left of the Three Horseshoes pub was a shop, with a petrol pump, which also used to sell paraffin for lamps which she was sent for. Mr Billy Ward ran the pumps. He had bird cages. Mary Greene painted a picture of him. Kath remembers her dad was an Oddfellow – he paid into the insurance scheme as they couldn’t afford doctors as there was no National Health then. Mr Ilsley from the PO ran it then. The scheme paid for them to see Dr Young. He had no waiting room, you went behind a curtain, and everyone could hear what was said. He seemed to give the same medicine to everyone. (Dr Young took his wife’s surname after marriage – some thought because he was German. Kath’s mother paid into the Foresters – another similar scheme – for the 3 children. They were given a badge. When Kath left school her dad put her into the Oddfellows. Her Uncle Bill used to play darts matches at the Oddfellows (in Green Man Lane) and won a clock. Most people were in the Oddfellows and the hall could be hired for special events. Oddfellows was to the side of the Mumfords (mother & daughter) sweet shop in Green Man Lane. Kath was 13 in 1939 and at the end of the year (14th birthday?) she went to work at Sawston paper mill. Later on, in 1948, she worked at Pyes when they were in the Oddfellows Hall. Then, when that closed in Harston, she went to Pye’s in Cambridge in the TV Dept where they worked on an assembly line making the boxes. She left not long after marrying, as she found the travel and housework too much to fit in together. During the WW2 Kath’s family coped well with rationing as her dad Fred Collins was then working for the River Board clearing ditches and caught rabbits and hares to eat. He kept ferrets to help with a little poaching! They also kept chickens. Kath’s mother Nellie and dad Fred bought a claybat house in Button End near the industrial estate, but knocked it down to build the new Violet Cottage. They had a two-seater horse and trap, keeping the horse on their own land. One moonlit night during the war when the Barrington Cement air-raid siren went off Kath’s family went out to their dug-out at the bottom of the garden (they had a long garden then at the end of Manor Close). 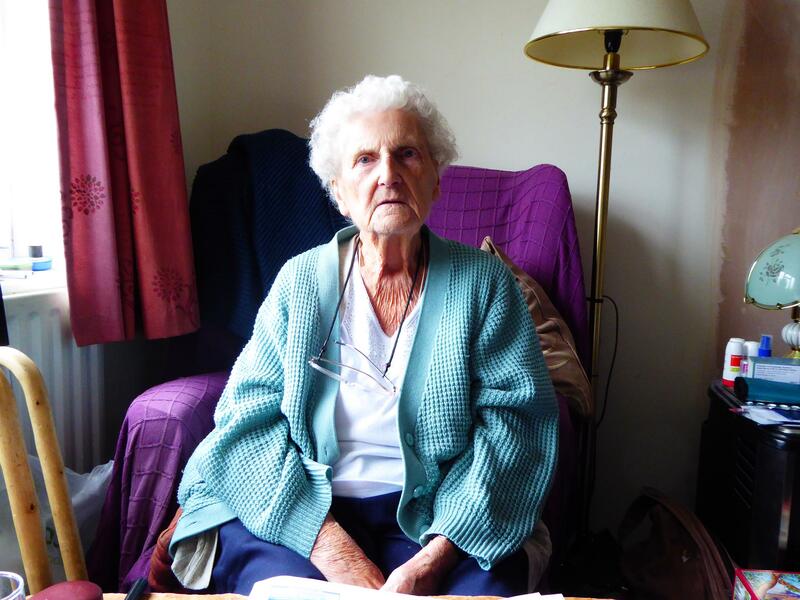 Her dad went out because he heard rustling in the leaves and early the next morning there were troops about in the High St stopping her mother getting on the Cambridge bus – presumably searching for possible spies. After the evacuation in Dunkirk, there were a lot of troops in Harston and the troop seemed to change after about six months. The Village Hall was used as a cookhouse and dining area. Ms Bliss’s ‘pest’ house was taken over for offices and Pinehurst had tents and nissan huts in the grounds. The big house to the left of the garage next to Sheepshead Row had the officers quarters. There was also a canteen in the chapel and in the Oddfelllows Hall. In the Drift trackway they kept all the lorries and tanks as these were screened by all the bushes, trees and woods. There used to be a sentry box at the entrance – a piece of cement still remains where that was. At night you could hear the revving up of lorries when they went out on manoeuvres. Kath lived in Manor Close until she married Bert Rayner and moved to 98 Queen’s Close. No 98 had 3 bedrooms, a big garden and an upstairs bathroom with bath and basin. The toilet and coal house was just outside. Later the council added a toilet in the bathroom upstairs. Mr Kingsley lived next door (he looked after the cemetery). After Bert died in 2006 Mr Kingsley encouraged Kath to apply for a smaller bungalow to live in, in Queen’s Close, which she got. Her bachelor son lives with her now. Queen’s Close used to be meadows where cows grazed and orchards – some greengage trees still exist that can be seen opposite Kath’s house. The orchard used to belong to Farringtons. Kath’s husband lived with his family in Harlton and his grandfather used to run the Hare & Hounds. Her father-in law, Christopher Rayner used to play the organ in Harston Parish Church and there is a book-table there in his memory. He met his wife Florence during WW1 and they moved from Harlton to Haslingfield. Bert moved to Harston, Manor Close, in his later school years. Before they were married Bert left the Army and he was a gardener first for Miss Laven, then for Dr Lindgren and Utsi after Miss Laven died. Bert also worked in the glasshouses in the Paddocks and had an allotment on the school playing fields. When Mr Dennis Chapman on the railway asked Bert to work at Harston Station he took that job as it was better paid, but later did some part time work for the Lindgrens until he was 80 years old. Bert’s job on the railways, working from Harston Station was to maintain the track by adding ballast, removing weeds and checking the rails every day to ensure they weren’t cracked by tapping them. He would check them all the way to the Shelford junction on one day, then another would walk along the line towards Melbourn. When Harston was closed he worked from Foxton but could be sent wherever he was needed. She recalls Charlie Thompson delivering coal by horse and cart around the village every week from his Station Rd yard. He had a big round covering most of the village. He bought the coal in summer, brought in by rail – there were big piles of it by the railway sidings. Thompsons put it into 1cwt sacks, stored it over summer and sold it in winter. Most people had coal stores if they could and bought coal in summer when it was cheaper. Charlie Thompson was the father of Margaret Gambie. She and her siblings were born and lived in the railway carriages to the right of the road into Trigg farm, the farmhouse to the left. To the left of the driveway was a row of 4 cottages- Mr Symonds lived in the first one to the left. He made hurdles. In the house to the right of the archway was a baker – Mr Dickie Badcock. He had a horse and cart and came round the village delivering bread and would give Kath and siblings a fresh roll. Where Orchard Close is now used to be a house where Eileen Hays lived. She ran a riding stable – at Baggot Hall, she thinks. Rodwells lived in Lime Tree Farm (same Shelford family as her father worked for in Hauxton). Then Joyce Collins lived there with her mother; they kept horses. Bass’s garage mended cars and had 2-3 pumps, one up on steps. Each pump had a clear globe on top and you used to have to wind a handle to fill up the globe with petrol, possibly a gallon’s worth, then let if flow through nozzle to car, then wind the handle again to get the next amount in. In a house set back from High St with big front windows was Knights shop that sold groceries. The shop was in the front bit of the house. Mrs Jackson’s hairdressers was to the left of the (grocers) shop at no 29 High St, and A B Northop had a shop to the right run by his wife, selling cottons, dresses, and similar goods. He used to go around with a suitcase of haberdashery goods selling cotton, elastic, etc. A B Northrop used to live in the house on left hand corner as you enter Queen’s Close but the house has been much changed and enlarged. Outside the Queens Head was a trough for the horses to drink from. There was also a fountain on the field side opposite the industrial estate in Button End and another on church corner. Dr Young’s house was to the left of the village Hall. He used to have a spring/fountain on his front lawn – where water flows now into ditch. The railings in front of passageway into Limes, next to the PO, mark the entrance to his house, are the original railings. Dr Youngs garden went back a long way from the High St. alongside the Village Hall. The bowling green used to be behind the telephone exchange area and the tennis courts where BT now is. The grass between there and the Village Hall used to be a play area. Between Dr Young’s and the Village Hall was a high wire fence. He kept St Bernard dogs behind it. His long garden went back as far back as did the tennis courts. Charlie Rodgers had an electrical shop next to the Coach & Horses. To right of Coach & Horses was a big house where a Dr lived. His wife was an actress and she used to put on some shows in the Village Hall. Originally the surgery had been at Dr Young’s house. After he died the National Health Service Surgery was opened next to the Coach & Horses. Dr Webb worked there and Dr Townley. After Dr Webb died, Dr Townley moved his surgery to his house at the east end of London Rd, and then to the Church St surgery later on. Kath’s mum’s cousin married a Long and they lived at the bottom end of Manor Close. Bill Long ran a coach service with one coach, which he kept in the field near the Old English Gentleman. There used to be a cornfield there. To the right of this in the 1940s was the Cater’s house. They had two boys who were killed in the war. One of them in the RAF was stationed at Duxford and he used to fly over his parent’s London Rd house and they would wave to him. To the right of Cater’s house was Jacksons who had a small coal business there (where the Chestnuts now is). He had a big yard with a black barn-like structure – probably made of wood- not brick. Where Vic Lawrance used to live was the police house until they built the new one on the High St, before Kath’s time. (House still there called the Old Police House). John Northrop (who lives in Meadow Way) took over the paper business from his dad, who started it. Eli Northop kept the paths and roads clean and in immaculate condition – probably into the 1960s, paid for by the parish council. The paths along A10 were always there in Kath’s time. Mr Maylin lived opposite the Cemetery. He used to clear ditches. He married one of Kath’s cousins on her dad’s side. Johnny Arden who lived next to the thatched house set back from High St had a big orchard and used to give the kids apples. Fred Lilley (who had bad knees) had a barrow and sold sweets and chocolate at the cricket matches. Kath remembers various Reverends when she was young, – Askham in1950s, De Candole then Percy Ward. We used to live opposite Kath Raynor at 39 Queen’s Close. She will remember my parents, George and Jessie West … both now dead. Although I now live in Essex, I have fond memories of Harston. I recall working on a fruit farm at the far end of the village during my school holidays and picking plums at a fruit farm in Barrington. A lorry used to pick us children up and take us from Queen’s Close to the farm in Barrington. Keep us out of mischief during the school holidays and we got paid!